Intellectual property has probably almost no value in Kenya and it will take another 5 years before anything changes. But in the 1950s and 1960s her own husband stole the intellectual property of painter Margaret and this true story is handled by director Tim Burton for the film Big Eyes. Margaret packs her bags and gets into the car with her daughter and drives off to San Francisco leaving behind her current husband. As she slowly starts to put her life back together she looks for a job and ends as one of the first women to work as an artist for a furniture company. At an art and crafts sale she meets her future husband Walter Keane. He is the complete gentleman and brilliant salesman. He takes it upon himself to find buyers for Margaret’s paintings that have children with unusually big eyes. As Margaret says in the film, “the eyes are the soul to a person and when I paint I put my heart into it” but nobody is interested in her work. Finally a bar fight and Walter admitting that the paintings are his set off a sale as everything lands on the front page of the local newspaper. Soon Keane paintings are selling off and he continues to grow the business by selling posters, opening their own gallery but the secret remains that Margaret is the actual painter. While the credit of the film goes to a simple true story, it should also be shared with the director Tim Burton and his star cast- Amy Adams (Margaret) and Christoph Waltz (Walter Keane). Amy is so delicate, innocent and a brilliant actress, she makes you believe in her low self-esteem conflict and triumph over a greedy man. She also won the Golden Globe Award for Best Actress in a Motion Picture- Comedy or Musical. Christoph really is a good salesman, devious, greedy and charming. He is at his usual Jekyll and Hyde in this film. 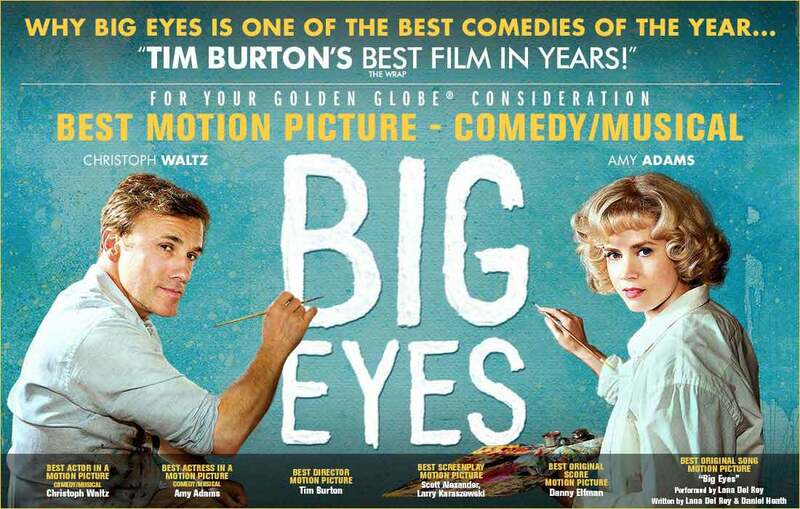 Big Eyes is inspirational and another great direction by Tim Burton whose previous hits include, Beetlejuice, Charlie & the Chocolate Factory and Alice in Wonderland.